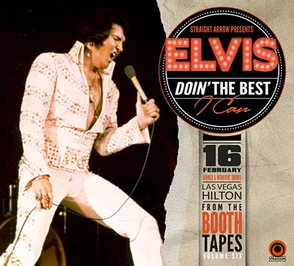 Coming from Straight Arrow is the 2CD set DOIN‘ THE BEST I CAN, featuring two shows recorded on February 16. Most Elvis experts agree that the „post Aloha“ winter engagement was his weakest up to that point. Perhaps his inner turmoils played a role, but a rather severe throat infection most definitely did. It was so serious that midnight shows on Feb. 13, 14 and 15 ended up getting cancelled and dinner shows were performed against doctors advice. At some of the shows it was clear that the infection seriously hampered his ability to sing. Still, being the professional that he was, he tried to do the best he could. This is also what you will hear on the previously unreleased concerts from this engagement on this new Straight Arrow release. Presented in truly excellent audience-recorded audio, they give us interesting insights of Elvis at work under trying circumstances. His voice is not at its best here, his condition prevents him from firing on all cylinders, but still he’s giving solid and professional shows. And that’s one element that certainly deserves to be acknowledged more than it is today. 01. Introduction: Also Sprach Zarathustra - 02. C. C. Rider - 03. I Got A Woman / Amen - 04. Love Me Tender - 05. You Don't Have To Say You Love Me - 06. Steamroller Blues - 07. You Gave Me A Mountain - 08. Fever - 09. Love Me - 10. Blue Suede Shoes - 11. Hound Dog - 12. Johnny B. Goode - 13. What Now My Love - 14. Suspicious Minds - 15. Introductions of singers, musicians, orchestra - 16. Introduction of Johnny Tillotson - 17. I Can’t Stop Loving You - 18. An American Trilogy - 19. Can't Help Falling In Love - 20. Closing Vamp / Announcements. 01. Introduction: Also Sprach Zarathustra - 02. C. C. Rider - 03. I Got A Woman / Amen - 04. Love Me Tender (with false start) - 05. You Don't Have To Say You Love Me - 06. Steamroller Blues - 07. You Gave Me A Mountain - 08. Fever - 09. Love Me - 10. Blue Suede Shoes - 11. Johnny B. Goode - 12. Hound Dog - 13. What Now My Love - 14. Suspicious Minds - 15. Introductions of singers, musicians, orchestra - 16. Introduction of Paul Anka - 17. I Can’t Stop Loving You - 18. An American Trilogy - 19. Can't Help Falling In Love - 20. Closing Vamp / Announcements.